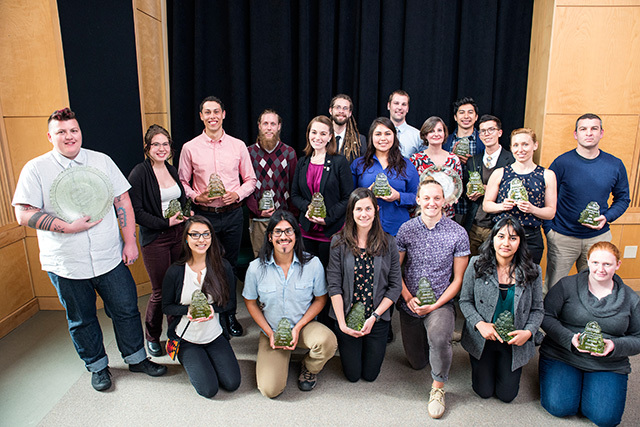 Humboldt State University announced its Outstanding Students 2016-2017 at award ceremonies on April 14. Geography major Cristina Bauss and Social Work Graduate Student Dylan McClure are HSU’s 2016 Outstanding Students. Geography major Cristina Bauss is being recognized for her accomplishments and her commitment to the discipline of Geography. At the 69th annual meeting of the California Geographic Society, the research she presented earned first place in the Joe Beaton Poster Award Competition. In 2015, Bauss was one of only a handful of undergraduates across the country to participate in the National Geographic Geography Intern Program. She’s also the only HSU student to be inducted as a member of the prestigious Gamma Theta Upsilon, the International Honor Society in Geography. The recipient of numerous HSU scholarships, Bauss is researching the environmental impacts of illegal cannabis cultivation in Humboldt County. Her work includes GIS-enabled quantitative spatial analysis of digitized aerial photography, cartography for effective geo-visualization, archival research for important historical-geographic context, and critical analysis of official documents. Academics aside, she mentors other students, assisting them with their research, and is gracious in her feedback. Popular, respected among peers and colleagues, Bauss embodies the community spirit of the Geography Department. Dylan McClure is a Social Work graduate student and an intern for the Health Education Department. Described as highly intelligent, open-minded, and a creative thinker, McClure is being recognized for his dedication to causes that are significant to the campus community’s health and well-being. An advocate for transgender rights and inclusivity, he created a comprehensive resource guide for trans and gender non-conforming students and worked with Information Technology Services to make institutional changes, which allow students to use a preferred name in HSU’s student registration software. He created and led a weekly group for transgender students who have experienced discrimination as an HSU student. 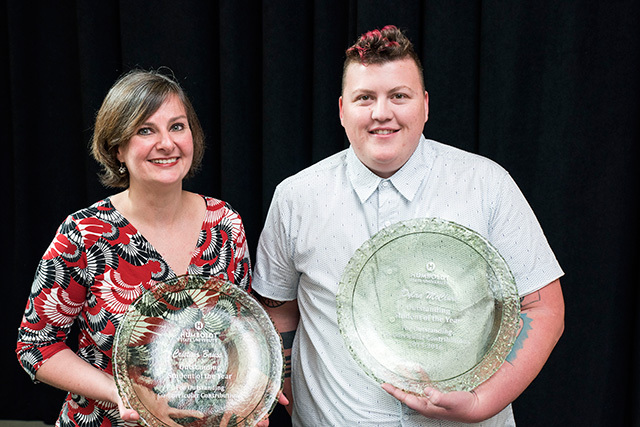 Plus, he has been working with faculty on the use of appropriate language about gender and gender identity for the campus-wide food and housing insecurity survey. McClure now serves on the Sexual Assault Prevention Committee and leads conversations about community accountability and healthy masculinity. In addition, Dylan is a guiding force of a nascent educational campaign, Humboldt Haze, which works to expose misconceptions around alcohol and other drugs. He mentors other student leaders and activists, and through his passion for activism, inspires others to get involved. The winners of the 2016 HSU Outstanding Student Awards.